Tonight at Miller Park, the Wisconsin Timber Rattlers beat the Peoria Chiefs, 5-3. 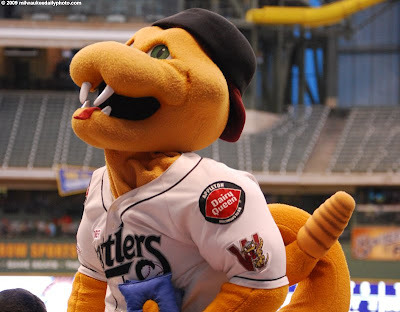 Fang, the Rattlers' mascot, was there along with his big-league counterpart, Bernie Brewer. The game was exciting, the between-inning entertainment was a little unique, and everyone seemed to go home with a smile.